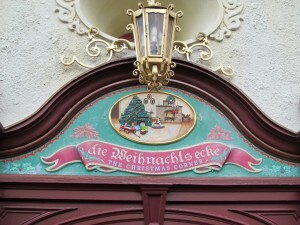 Willkommen im Biergarten Mamas and Papas! 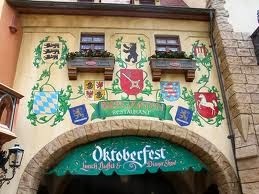 The Biergarten in Germany at Epcot is one of our family’s favorite spots. It is German food buffet and it includes the Oompah Band as entertainment and it is Octoberfest year round there! What more could a German girl want? 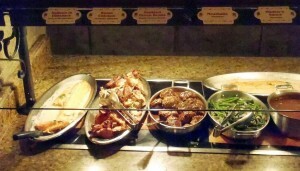 First the food: The Spaetzel is my favorite thing on the buffet(picture above courtesy of our friends at Disney Food Blog). The kids love it too! It is so delicious I could eat an entire plate of it! It is so buttery! 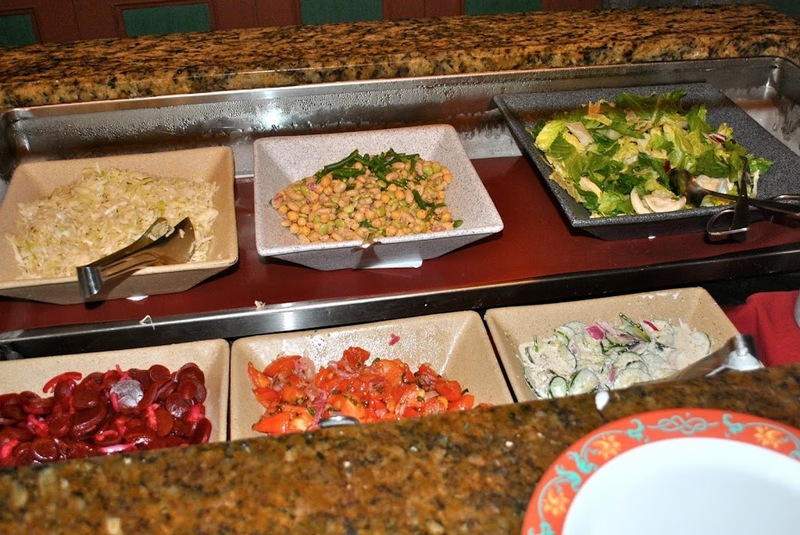 There’s also an incredible salad buffet. The beet salad and the cucumber salad are my top picks there. There was so much meat on the buffet: Schnitzel, Salmon, Brats, carving stations, and more! And of course the sauerkraut is a must try. There’s a huge dessert area. Blackforest cake, vanilla pudding with chocolate chips, and freshly baked apple strudel to name a few of my favorites. This is one of the heaviest meals you will have at Disney. They do serve a lunch and a dinner option but the buffet is the same for both. We went for lunch when I was pregnant and it was still way too much food for a lunch! Definitely opt for dinner. 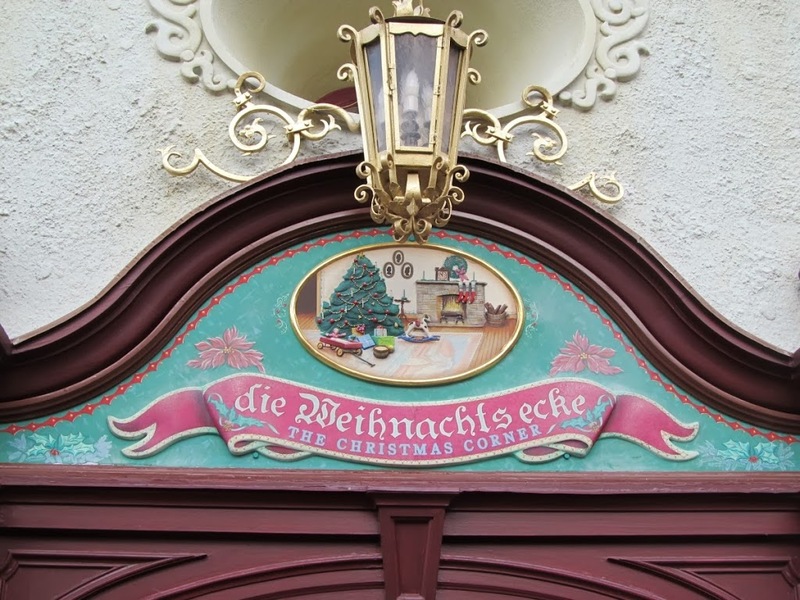 One of my favorite times of year to do the Biergarten is at the holidays. 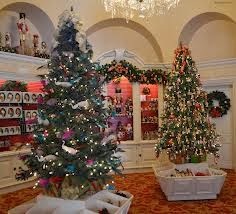 It is one of the Candlelight Processional package restaurants. Something about that combo really strikes at my nostalgia. 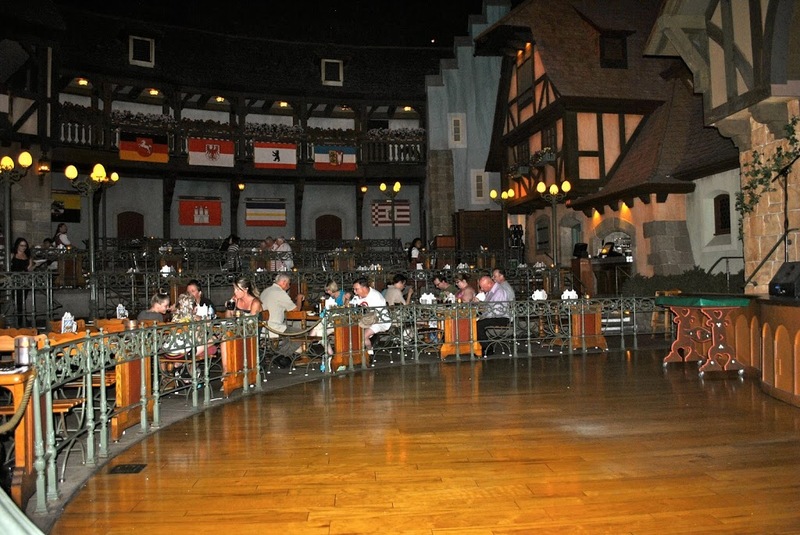 The Atmosphere and Entertainment: You are likely going to be seated with other families. 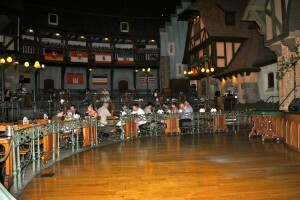 The inside of the restaurant is meant to feel just like a Biergarten in Germany would. Community tables are part of the charm and fun. You can get to know your table mates while you enjoy dinner. It is also a great place for large groups. 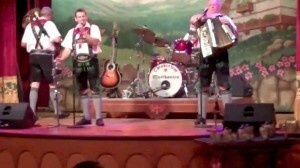 The Oompah Band Plays about once an hour. It is definitely a must see show. It lasts 25 minutes a set. I encourage you to get on the dance floor and have fun with this. Kids love it! 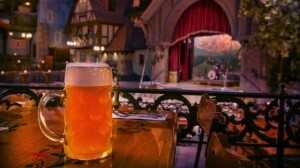 Beer and Wine: Of course there’s beer at the Biergarten! I love the beer flights. I am not a big fan of German wine but I drink it in small amounts. For the sizing of the beers, remember a German large is much larger than our large here! My husband always goes for the large one-it is one liter. He likes the Hovels and the Altenmunster Octoberfest. The Biergarten is one table service credit on the dining plan except for the Candlelight Processional package then it is two. It is one of our frequent locations to choose.